The best method of dealing with destructive garden insects is by preventative controls before the bug becomes an infestation. To this end farmers and gardeners have long used a vast arsenal of chemical insecticides. they are often used when they really aren't even needed. I've never quite figured out why God created some of these leaf-sucking scumbug insects. Obviously He had his reasons. In His wisdom though, he also created many insects with which we can fight the aphids, spider mites and other creatures which live to prey upon our flowers. Consider putting some of these beneficial insects to work in your garden. Using beneficial insects as a biological control of destructive insects is by no means a new concept. Gardeners have long known of the effectiveness of Ladybird beetles to eliminate aphids. There are many more 'good bugs' out there, they just haven't received the stature of Lady Bugs, because they may not be quite as cute, or maybe the name of a Trichogramma wasp may not sound as sweet. Nonetheless, these beneficial insects will help to keep your garden free of harmful pests. and hopefully reduce or eliminate the need for much of the use of insecticides in the home garden. Invite beneficial insects to your garden by growing plants and flowers which provide food and a home for them. You an also purchase many good bugs at most larger nurseries and garden centers, but you will still want to provide them with suitable plants. Don't over populate your garden with beneficial insects though, because if there isn't enough prey for them they will simply leave your garden in search of food elsewhere. Monitor your plants regularly and if you find that the beneficial insects are outnumbered you may need to add reinforcements. Many of the insects which you can use for insect control don't actually do any control work themselves. They spend their lives enjoying the nectar and pollen from your flowers, and creating offspring. It is the larvae stage of these offspring which does the actual hunting and eating of the harmful insects. The list of beneficial insects is rather extensive. The most common and readily available insects are listed below, but this is by no means a complete list. Check for the availability of different types of beneficial insects in your area, and choose the ones which suits your needs. Cryptolaemus Beetles resemble the Ladybug but are darker in color. After the adults are released into the garden they will immediately seek out mealy bugs and consume them. The eggs are usually laid on an infested plant so that the larvae can feed on the mealy bugs as well. Green lacewings larvae (Aphid Lions) will eat spider mites, thrips, leafhoppers, whiteflies and caterpillar eggs. This insect is normally purchased in the egg stage, and allowed to hatch out in the proximity of an insect problem. The larvae will feed for only 2 or 3 weeks before becoming adults, at which time it may become necessary to introduce additional larvae to your garden rather than relying on the reproduction habits of your adults. Lacewings are most effective when a large number of the larvae are introduced into a limited area. Ladybugs (Ladybird beetles) feed on aphids, chinch bugs, whiteflies, and mites, as well as many other soft-bodied insects and their eggs. 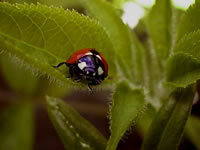 There are more than a hundred ladybug or "ladybird beetle" species. These insects are normally purchased as adults and released into the garden. Each adult may consume as many as 5,000 aphids during their adult life. When mature, each female will begin to lay as many as 3-4 dozen eggs each day. Upon hatching, each ladybug larvae will begin consuming 50 aphids each of the 21 days until they reach the adult stage, when the cycle begins again. No matter how you add it up... that's a lot of aphids and undesirables removed from your plants. Parasitic nematodes are microscopic worms whick seek out and then eat their way into the bodies and killing many soil dwelling pests including grubs, weevils and webworms. Soil conditions and the method of releasing the nematodes are critical, so be sure to read and follow the directions. Nematodes must be replaced each spring. Praying mantis feed on a wide range of pests, including aphids, flies, and beetles. They are purchased as egg casings which are set in shrubs around the garden. Hatching takes about 2 weeks, after which the Mantis will begin to consume insects. Unfortunately they will also eat some beneficial insects (not ladybugs though) if sufficient pest bugs are not available. Praying mantis tend to be a curious and friendly bug, which may end up keeping you company as you work in the garden. Predator mites are very useful in controlling spider mites and two spotted mites, both indoors and in the garden. They are purchased as adults which will eat 1-3 adult mites or up to 6 mite eggs each day. Spined Soldier Bugs (stink bugs) prey on many types of beetles, webworms, armyworms and other garden pests. They are normally purchased as a combination of nymphs and adults. Because they are generally only effective for a month or so, it is sometimes necessary to release additional predators if the adult population has diminished or if subsequent plantings are desired. Trichogramma wasps are tiny wasps which prey on the eggs of more than 200 worm type pests, including borers, webworms, and many types of moth caterpillars. The wasps lay their eggs directly into the pest's eggs, killing the eggs as they hatch. As soon as the wasps mature, they will fly off in search of new eggs to parasitize. Different species of Trichogramma wasps are more effective against certain pests, so purchase eggs appropriate for the pests which have invaded your garden. Once you have made the decision to utilize beneficial insects to help you with your pest control in your garden, keep in mind that insecticides are no longer an appropriate option. Pesticides will kill good bugs at the same time they are removing the pests.